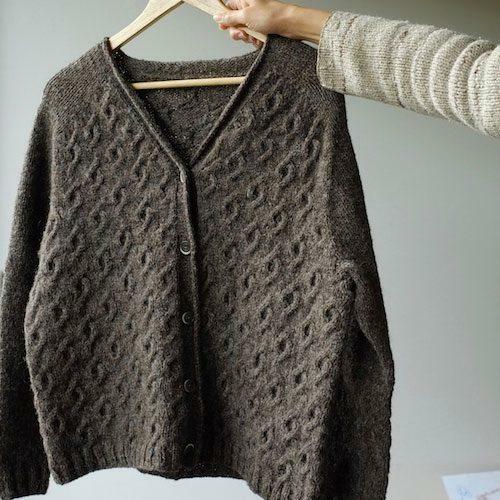 We were struck, as we looked through thousands of knitting patterns, by how varied the notion of a cardigan is. What you will see below is an array of silhouettes, textures, and techniques that range widely. And that’s why we love this category. There’s a cardigan for every mood. Remember that Round 1 voting for MDK March Mayhem begins on Thursday, March 21. Remember: if you love a pattern, buy it if you can. You’ll make that designer’s day. 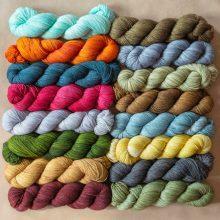 And when you order the yarn for it from MDK, you’re helping us keep our daily content free for everybody. Here, listed in alphabetical order by designer’s last name, are 16 cardigans that are just flat-out terrific. CardiZen by Bayron Handmade. Big stitches, ultra-wide lapels. 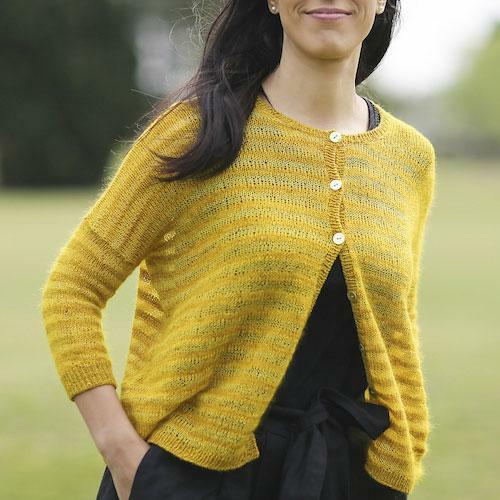 A cardigan that knits up in a snap and does the impossible feat of looking fantastic on both adults and kids. Rumo by Alice Caetano. A rustic yarn in the city. Trim waistcoat silhouette accentuated by vertical lines of garter stitch. 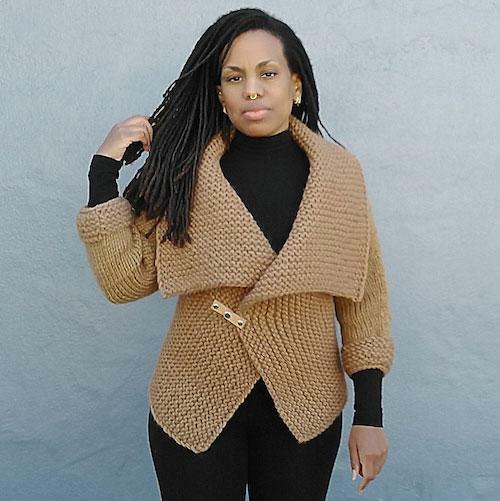 Fun to knit: modular construction, and that notched lapel. Savage Heart by Amy Christoffers. 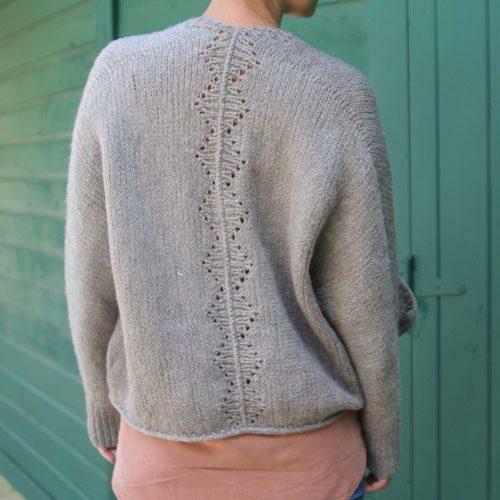 A brilliant, wearable translation of a baby sweater into a grownup’s wardrobe staple. 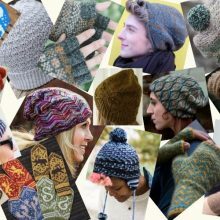 The sleeve-to-center construction makes it an entertaining brain teaser to knit. Mariage Soeurs by Kathleen Dames. Lacy front, tidy fit, and that long zig zag down the sleeve. Tabouli by Carol Feller. Pared down yet full of knitterly details: lacy cables, saddle shoulders, and a cool faux pleat on the back. Clamber by Norah Gaughan. 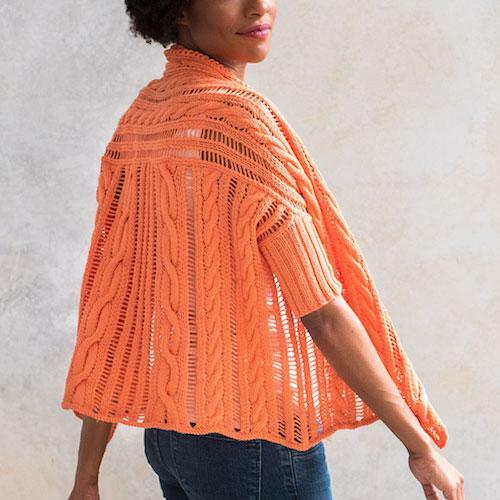 We keep looking at the photos going “how?” Halfway between shrug and cardigan, with a fascinating fabric combining cables and open mesh. Kaare by Emily Greene. Mesmerizing traveling ribs, a feat of wearable engineering with a shawl collar and set-in pockets. Sheffield by Amy Herzog. An easy-going basic with finesse. Would wear the heck out of this. Holyport Street by Erika Knight. A classic nod to granddad but with lovely details in the ribbed, notched collar, vented hem, and pockets. Knit in pieces, old school. Elton by Joji Locatelli. Featherweight, translucent, flattering in every size and color we’ve seen. 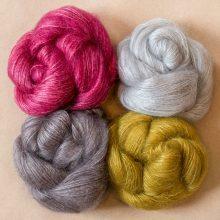 Get some of that gorgeous laceweight mohair/silk into your life without, you know, lace. Boxed and Cabled by Hanna Maciejewska. Open fronts that overlap and a calligraphic sideways cable that flows from the back of the shoulders to the sleeves. No buttons means: we won’t procrastinate the buttons. Natsu by Ambah O’Brien. 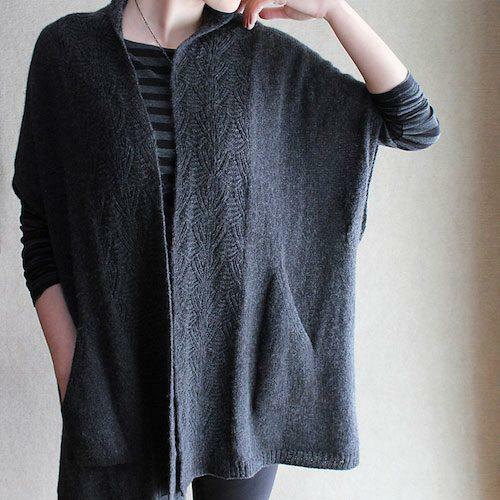 An ethereal raglan cardigan that wears like a shawl. 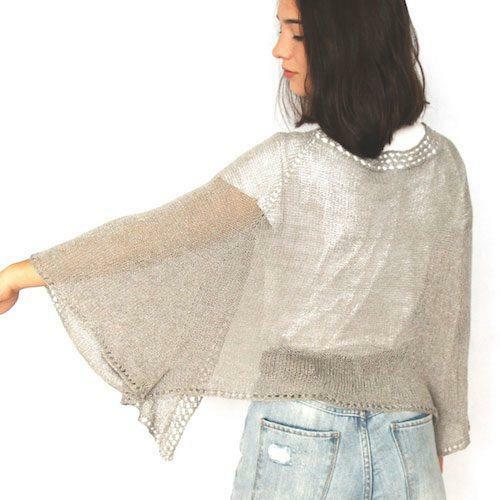 Solves all our summer sweater problems. Dissent by Andrea Rangel. Stunning with or without the beautiful gesture of respect for Justice Ginsburg. Winter Lines by Katrin Schneider. Playing with proportions of the simplest of textural motifs: ribs. 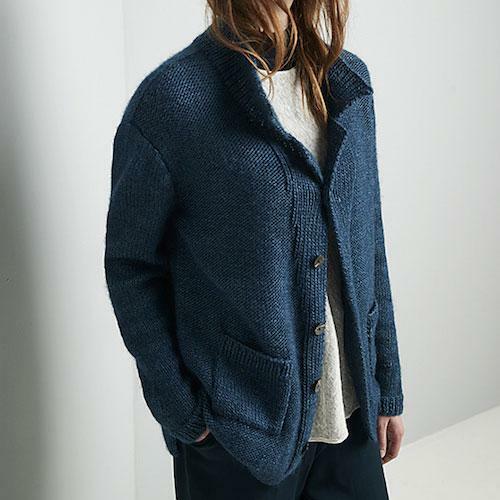 Love the oversized fit and the lighter fabric of half-brioche. Mistigri by Orlane Sucche. Chewy all-over cables on the body, stockinette sleeves, v-neck. The formula for a cardigan to take up residence in. Capture the Moment by Carol Sunday. Subtle brocade edges, the flowing fit, and those slant pockets—this is a gorgeous forever piece. Your favorite Mayhem pattern + MDK yarn = winning! 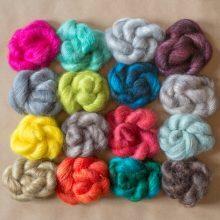 In serious love with rumo amd want to cast on asap – what yarn would you suggest from the MDK shop? I want the rustic neutral look of the original. 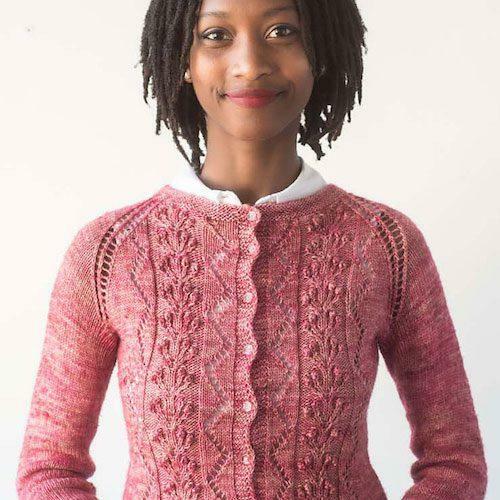 I would like to say that clicking through to the Ravelry images and seeing what they look like on other bodies and yarns and colors made a difference in how I reacted to the pattern. Changed/opened my mind to some that I may not have considered. Thanks for the links. Martha L, this was my experience exactly. 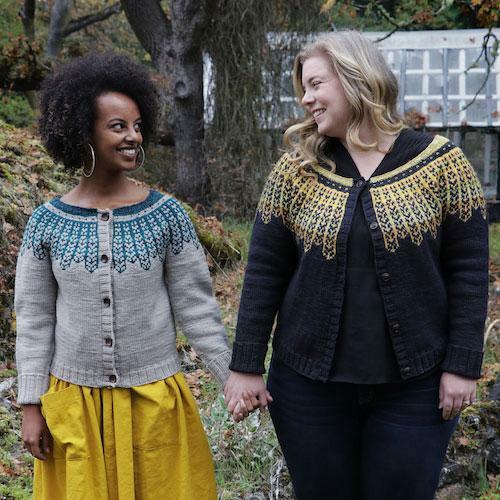 There are now two patterns that I am seriously considering making after searching the Revelry project pages, but had it been for the pattern photo alone I never would have considered them. Wow! Really nice choices. 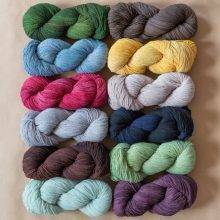 I’ve been searching for a cardigan pattern for some cotton I have in the stash – I’ve saved several of these in my favorites and fairly certain one of these will be on the needles soon. 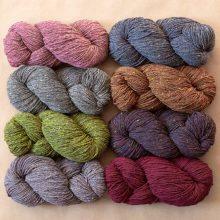 I just cast on the Savage Heart cardi in Mohonk. I makes such a gorgeous, light fabric at this gauge. So lovely. Be still my heart. 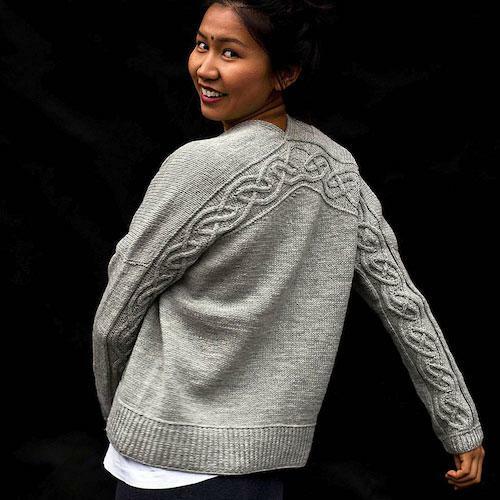 I looked at a number of these sweaters on Ravelry and have “favorites”. 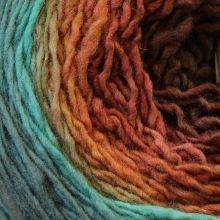 I have almost 2 pounds of handspun perendale lamb yarn that is waiting for a worsted sweater. This amount of yarn is still growing into an amount for a nice sweater. This list really helps. I am pretty sure that I will knit the Savage Heart sweater. I always love Carol Feller’s architectural designs, though. 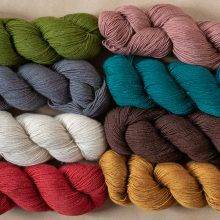 I also have loads of CVM sportweight yarn (from my sheep). Such great choices. Even if my nomination wasn’t picked. I like Rumo and Savage Heart. I am just about finished with the baby Cockleshell Cardigan. I only had to rip out the pattern on the left side edge three times yesterday. So, I feel likeI have it down now, I think Spud and Chloe Sweater…. I love how Kay’s turned out but I can’t recall the yarn. I used Elemental Affects Cormo Worsted but my next one will be Soud & Chloe Sweater after seeing how nicely Cristina’s turned out. 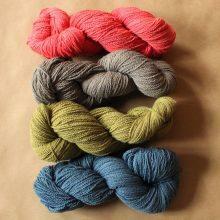 Which MDK yarn would you choose for Tabouli? I am in love with Kaare and Cardizen. 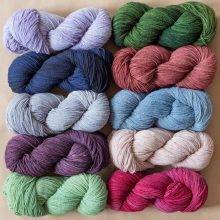 Can you suggest which of your yarns for each of these? I want to support MDK! I love your emails. Thanks so much for all that you do. Living in Colorado, not by choice, the weather changes frequently. Last Wednesday we had a snow storm that closed everything and yesterday it was in the 50’s. Can’t decide whether Tabouli or Boxed &Cabled is my favorite. I misunderstood last year’s contest, but think I have it now. I copied the brackets to Preview & am going through Ravelry looking at each entry & how they look in different colors & done by amateurs (like me!). Once I’ve done this fun chore, I complete the brackets. It’s taking forever to study 64 patterns, but whaddayagonnado! So what if I’m not finishing chores or actually knitting? They don’t call it March MADNESS for nothing!! You have outdone yourselves this year! What a roundup of great designs! Must. Knit. ALL. The. Cardigans! My goodness such a lovely collection of cardigans! The voting will be difficult. These are some flat out fabulous designs, only a few of which I’ve seen. THANKS! How? Supposed to be how??? I have been wanting to try a sweater. 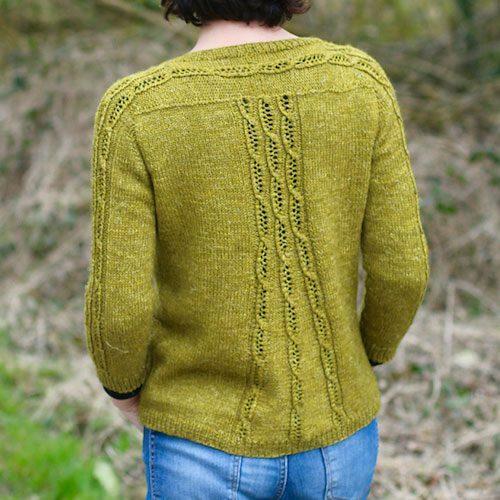 Sheffield cardigan caught my eye and is supposed to be good for beginners so maybe it is time to jump in. Where do i find this patterns?